I have been banding birds for 18 years and I would like to start a series on my recapture birds that I have encountered during my banding carrier. 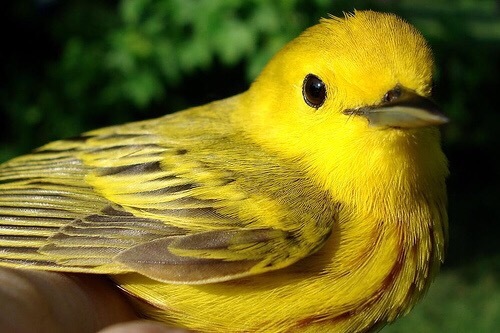 The first bird that I would like to share is the Yellow Warbler. Happily a recent trip to Allegany State Park yielded a warbler that I don’t often see – a Northern Parula. 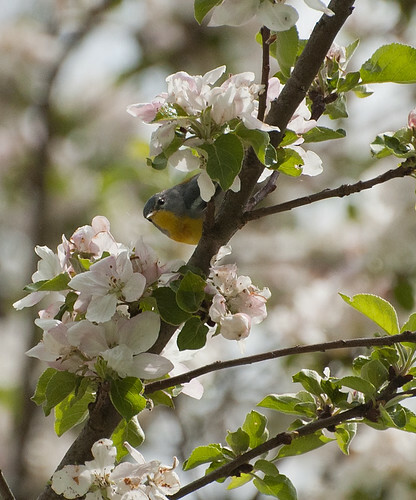 It, along with several other birds, seemed to be playing peek-a-boo with me while working its way through this beautiful flowering tree. Some field marks for the Northern Parula visible to varying degrees in the photo include white crescents around the eyes, white wing bars (2), yellow neck and chest with a reddish bar across the chest, and grey-blue head and wings. Great time of year for birding. 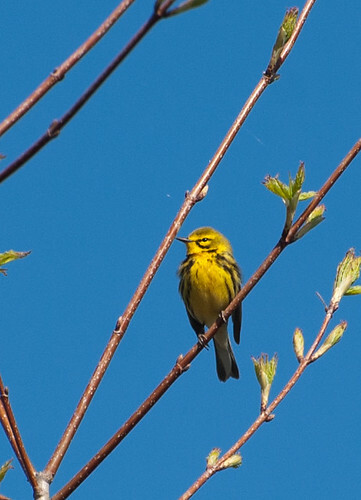 Lots of warblers are moving through the area. Nine species so far, hoping to add some more this week. 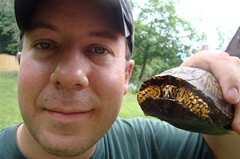 Enjoyed spending a recent Saturday morning at Tom’s bird banding station in Allegany State Park. It is always fun to be able to see the birds so closely – and to really examine the features that often only seem to exist in field guides! 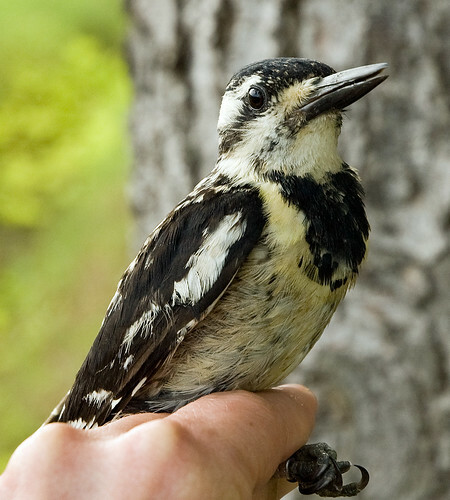 This second year yellow-bellied sapsucker was a bit unusual because it has not started showing any red on its head (or throat if it is male). Tom’s bird banding is part of the Institute of Bird Population’s MAPS program. MAPS stands for Monitoring Avian Productivity and Survivorship. Analysis of the data Tom and other bird-banders collect “provides critical information relating to the ecology, conservation, and management of North American landbird populations, and the factors responsible for changes in their populations.” (Source: http://www.birdpop.org/maps.htm). On June 10-13 the Roger Tory Peterson Institute in Jamestown, NY held its second birding festival. The days were filled with wonderful field trips led by incredible guides, and workshops by some of the top men and women in the field. I feel very lucky to have this opportunity so close to home and I really, really enjoyed myself (I sense a certain son of mine will shake his head as he reads this – and speaking of shakes, we felt the tremors from the 5.5 earthquake centered near Ottawa, Canada on 6/23, a first for me). 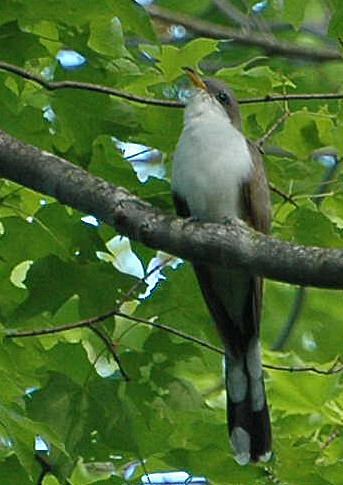 The yellow-billed cuckoo shown above was one of the many (over 50?) species seen on the Woodchuck Hill field trip. It was a crowd pleaser, giving the whole group an unusually long look. It seemed to many attendees that there are more cuckoos around this year, likely because of the abundance of tent caterpillars.